According to the WHO Global Tuberculosis (TB) Report 2017, Malaysia has 29,000 TB case notifications/year, and the incidence of TB is 92 cases/100,000 population. In 2015, treatment success rate among the new and relapse cases in Malaysia is 78%, a rate that is similar to that of South East Asia region but lower than the global rate. Among Malaysia states, Sabah state has the highest prevalence of TB., Pressurized by the high TB prevalence and the urge to improve patient's adherence, in 2012, the Ministry of Health, Malaysia, has launched the 3rd TB clinical practice guideline to make a Grade A recommendation that prefers fixed-dose combination (FDC) anti-TB drug as the first-line regime for intensive phase treatment for newly diagnosed pulmonary TB patient, unless patients developed toxicity, intolerance, or contraindication to specific component drugs.,, This recommendation was based on two multicentered randomized controlled trials (RCTs), involving countries in Africa, Asia, and Latin America between 2003 and 2008 that have demonstrated noninferiority on efficacy and safety of FDC against conventional separate-drug regime that consists of ethambutol, isoniazid, rifampicin, and pyrazinamide (EHRZ)., Both the studies reported insignificant difference in adverse events such as mild-to-moderate gastrointestinal and dermatological disorder when comparing both drug regimes., A meta-analysis claimed that FDC has better patient acceptability and reduced the risk of medicine noncompliance by 26% due to its simplicity in drug administration. The objectives of the study are to compare the sputum conversion rate of both treatment groups at 2nd and 6th months and to compare the treatment outcomes of both treatment groups at the end of 6th month. This study will establish the evidence on real-world effectiveness of FDC versus EHRZ, and it will serve as a scientific validation for Malaysian policymakers to support the first-line use of FDC in routine clinical practice. This was a propensity-match cohort study carried out using population data. Data were obtained from the Tuberculosis Information System (TBIS), a mandatory registry that was established for the use nationwide since January 2003. It is a computerized registry since 2012, used by the Centre of Disease Control Division of Ministry of Health Malaysia to register all TB case notifications in Malaysia. TBIS contains comprehensive information for each notified TB patient in Malaysia. TBIS includes variables such as patient demographic, diagnostic result, disease characteristic, TB history, treatment regime, and outcome. Definition of the variables can be obtained from the TBIS manual. This database is maintained and audited by the state health department's TB and Leprosy Unit to ensure completeness and accuracy. We were authorized to utilize data from the Sabah TBIS registry to conduct this study as Sabah state has the highest load (up to 20%) of TB patients in Malaysia. Patient allocation to either EHRZ or FDC was based on the physician decision in each clinic. There were 20,534 tuberculosis cases recorded in Sabah TBIS registry between January 2012 and June 2016. The cases were filtered according to the inclusion/exclusion criteria [Figure 1]. 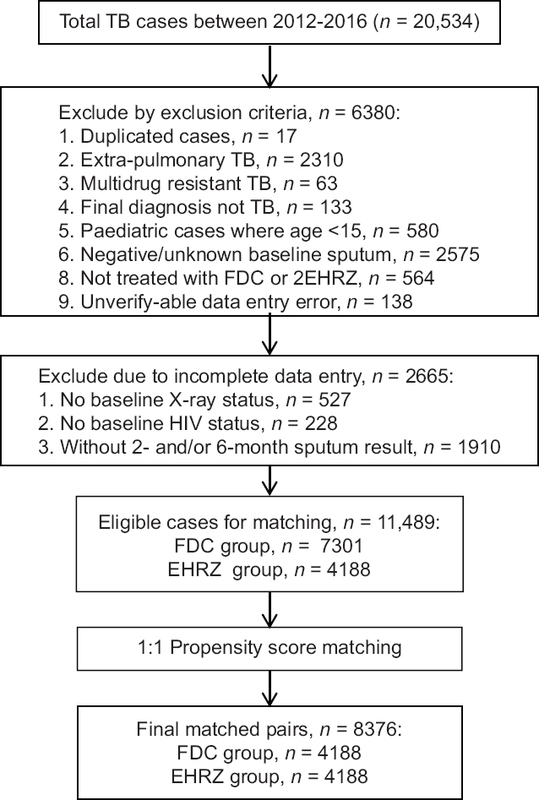 Main inclusion criteria were the pulmonary tuberculosis prescribed with either FDC or EHRZ, age ≥15, positive initial sputum smear and main exclusion criteria were missing data for treatment outcome and co-variates needed for propensity score matching. Patient selection process resulted in a total of 11,489 eligible cases for this research. In the TBIS registry, patients were not randomized to either FDC or EHRZ. To reduce the patient's baseline and treatment selection bias, we propensity-matched the FDC and EHRZ groups to the ratio of 1:1. Caliper matching was conducted using XLSTAT software using maximum tolerance score of 0.001. The matching characteristics included were gender, nationality, diabetes, HIV status, smoking status, and chest X-ray status. This resulted in 4188 matched pairs for statistical analysis. The differences between the two matched samples were tested with a standardized difference [Table 1]. The effectiveness and event outcomes between the FDC and EHRZ groups were assessed by the Chi-square test in SPSS v 19.0. All dichotomous variables were presented in n (%) and P < 0.05 was deemed statistically significant. From the TBIS registry, there were 20,534 patients between January 2012 and June 2016. Propensity score matching yielded 4188 pairs (n = 8376) in EHRZ and FDC groups for final analysis. As shown in [Table 1], propensity score matching minimalized baseline biases in both treatment groups as standardized differences in two groups were smaller than 0.2. In this study, about two-third of the patients are Malaysian, male, and smokers; a majority of the patients have minimal and moderately advance chest X-ray lesion; and <10% of them are diabetic or HIV positive. As presented in [Table 2], patient's sputum conversion rate after the 2-month intensive phase treatment was significantly higher among FDC group when compared to the EHRZ group (96.3% vs. 94.3%; P < 0.001). The sputum conversion rate at the end of the continuation phase treatment (6 months) was 0.1% higher in the FDC group, but this difference is not statistically significant. In terms of treatment outcomes, noncompliance and failure rate were the same in both treatment groups. Noncompliance to treatment was defined as discontinuation of treatment for ≥2 months consecutively from the TB clinic. As presented in [Table 3], treatment success rate at the end of the continuation phase was higher in the FDC group, but the 0.3% difference was not deemed statistically significant. Incidentally, it was found that patients who were on the FDC formulation suffered significantly lesser all-cause death compared to patients treated with conventional separate-tablet EHRZ. Despite the fact that previous studies showed noninferiority when compared the efficacy of FDC formulation to conventional EHRZ, our study with data of 8376 patients showed that FDC yielded significantly higher sputum conversion rate than EHRZ regime after 2 months of intensive phase pharmacotherapy. However, at the end of the continuation phase, both groups achieved similarly high 6-month sputum conversion rate that was just slightly low of 100%. This observation of no significant difference was expected as the use of FDC was only during intensive phase (initial 2 months), and all the patients were kept on standard separate-drug regime of isoniazid and rifampicin during continuation phase (subsequent 4 months). We wished to draw the reader's attention to the definition of noncompliance in this research. The Malaysian Clinical Practice Guideline has made it mandatory for all TB patients to be supervised under “direct observed treatment” surveillance to ensure medication adherence. Hence, “noncompliance to treatment” is defined as lost to follow-up and discontinued treatment for ≥2 months. The noncompliance rate in this cohort was observed to be relatively low, at 0.8% (combined both groups), when compared to a state TB statistics report of <3%. One explanation given was that this study cohort was a selected group of patients according to a set of inclusion and exclusion criteria [Figure 1] where patients who are not suitable for FDC and EHRZ due to toxicity, intolerance, and contraindication as well as incomplete data were excluded from the analysis. An intriguing incidental finding in this study was a significant lower death rate in the FDC group when compared to the EHRZ group. It was speculated that FDC has a protective effect against TB mortality. However, further investigation is needed before making any conclusion. It is suggested that the complete TBIS national database be examined in future to further confirm the association between anti-TB regimes (FDC or EHRZ) and mortality rate. As for now, there were 27 mortality cases in this 5-year cohort. The causes of death reported were infection and lung disease related (n = 20), cardiac cause (n = 2), malignancy (n = 2), and unknown (n = 3). The strength of this study is the utilization of real-world population data, instead of RCT, to assess the medication effectiveness in clinical practice. The use of propensity score matching is also a powerful analysis to remove baseline biases before making a comparison of the treatment effect. However, we suggest that if the standardized difference of baseline variables is not >0.2 (no difference between 2 groups), we probably will not require a propensity score matching because we can retain more patients for final analysis. The main limitation of this study, like most registry-based studies, is data incompletion. We have to exclude 2665 patients from the analysis due to incomplete data [Figure 1]. The study result will not be affected by the exclusion of these patients, but the result can represent the population if the data were more comprehensive and larger. The real-world effectiveness of FDC has been scientifically validated in this study. FDC formulation has extra advantages over conventional EHRZ in terms of 2-month sputum conversion and mortality rate. Two types of regimes were able to yield similarly good long-term treatment outcomes. These findings provide strong evidence for policymakers' decision to switch from separate-drug regime to FDC, and thus the recommendation in Malaysian Clinical Practice Guideline should be followed. This study was conducted in accordance to the ethical principles outlined in the Declaration of Helsinki and the Malaysian Good Clinical Practice Guideline. The National Medical Research Registration (NMRR) code for this study is NMRR-16-2010-31262. The authors would like to extend their gratitude to Dr. Christina Rundi for allowing the use of TBIS registry and Mr. William Lau for his expertise in propensity score matching technique. We also thank the Director General of Ministry of Health, Malaysia for his permission to publish this article. World Health Organization. Global Tuberculosis Report 2017. Geneva, Switzerland: World Health Organization; 2017. p. 1-262. Iyawoo K. Tuberculosis in Malaysia: Problems and prospect of treatment and control. Tuberculosis (Edinb) 2004;84:4-7. Dony JF, Ahmad J, Khen Tiong Y. Epidemiology of tuberculosis and leprosy, Sabah, Malaysia. Tuberculosis (Edinb) 2004;84:8-18. Clinical Practice Guidelines on Management of Tuberculosis. 3rd ed. Putrajaya: Malaysia Heath Technology Assessment Section (MaHTAS); 2012. Available from: http://www.moh.gov.my. [Last accessed on 2018 Feb 01]. Blomberg B, Spinaci S, Fourie B, Laing R. The rationale for recommending fixed-dose combination tablets for treatment of tuberculosis. Bull World Health Organ 2001;79:61-8. World Health Organization, editor. Programme World Health Organization. Treatment of Tuberculosis: Guidelines for National Programmes. 3rd ed. Geneva, Switzerland: World Health Organization; 2003. Bartacek A, Schütt D, Panosch B, Borek M, Rimstar 4-FDC Study Group. Comparison of a four-drug fixed-dose combination regimen with a single tablet regimen in smear-positive pulmonary tuberculosis. Int J Tuberc Lung Dis 2009;13:760-6. Lienhardt C, Cook SV, Burgos M, Yorke-Edwards V, Rigouts L, Anyo G, et al. Efficacy and safety of a 4-drug fixed-dose combination regimen compared with separate drugs for treatment of pulmonary tuberculosis: The study C randomized controlled trial. JAMA 2011;305:1415-23. Bangalore S, Kamalakkannan G, Parkar S, Messerli FH. Fixed-dose combinations improve medication compliance: A meta-analysis. Am J Med 2007;120:713-9. Agrawal S, Kaur KJ, Singh I, Bhade SR, Kaul CL, Panchagnula R, et al. Assessment of bioequivalence of rifampicin, isoniazid and pyrazinamide in a four drug fixed dose combination with separate formulations at the same dose levels. Int J Pharm 2002;233:169-77. Revicki DA, Frank L. Pharmacoeconomic evaluation in the real world. Effectiveness versus efficacy studies. Pharmacoeconomics 1999;15:423-34. Nallamothu BK, Hayward RA, Bates ER. Beyond the randomized clinical trial: The role of effectiveness studies in evaluating cardiovascular therapies. Circulation 2008;118:1294-303. Saturni S, Bellini F, Braido F, Paggiaro P, Sanduzzi A, Scichilone N, et al. Randomized controlled trials and real life studies. Approaches and methodologies: A clinical point of view. Pulm Pharmacol Ther 2014;27:129-38. Cohen AT, Goto S, Schreiber K, Torp-Pedersen C. Why do we need observational studies of everyday patients in the real-life setting? Eur Heart J Suppl 2015;17 Suppl D: D2-8. Available from: https://www.academic.oup.com/eurheartjsupp/article-lookup/doi/10.1093/eurheartj/suv035. [Last accessed on 2018 Feb 02]. Rosenbaum PR, Rubin DB. Reducing bias in observational studies using subclassification on the propensity score. Am Stat Assoc 1984;79:516-24. Available from: http://www.tandfonline.com/doi/abs/10.1080/01621459.1984.10478078. [Last accessed on 2018 Feb 02]. Rosenbaum PR, Rubin DB. The central role of the propensity score in observational studies for causal effects. Biometrika 1983;70:41-55. Available from: http://www.links.jstor.org/sici?sici=0006-3444%28198304%2970 %3A1%3C41%3ATCROTP%3E2.0.CO%3B2-Q. [Last accessed on 2018 Feb 02]. Perkins SM, Tu W, Underhill MG, Zhou XH, Murray MD. The use of propensity scores in pharmacoepidemiologic research. Pharmacoepidemiol Drug Saf 2000;9:93-101. Infectious Diseases Prevention and Control Act. Malaysia; 1988. Available from: https://www.scribd.com/document/75615992/Prevention-and-Control-of-Infectious-Disease-Act-1988. [Last accessed on 2018 Aug 15]. Manual for National Tuberculosis Information System. Kuala Lumpur: Tuberculosis and Leprosy Control Unit, Ministry of Health; 2015. Available from: http://www.jknns.moh.gov.my/index.php/mengenai-kami/2017-03-23-07-41-27/pengenalan?id=186. [Last accessed on 2018 Feb 06].